Ginkgo Leaf Extract (Ginko Bilobae) The Ginko tree is believed to originate in Asia and is a staple in Chinese Medicine. It is known as on of the oldest living trees on Earth, with a single tree being able to live for up to 1000 years. The leaf extract is is used to make a very popular supplement sold the world over for mental acuity and research has shown it may have some ability to ease symptoms of Alzheimers. 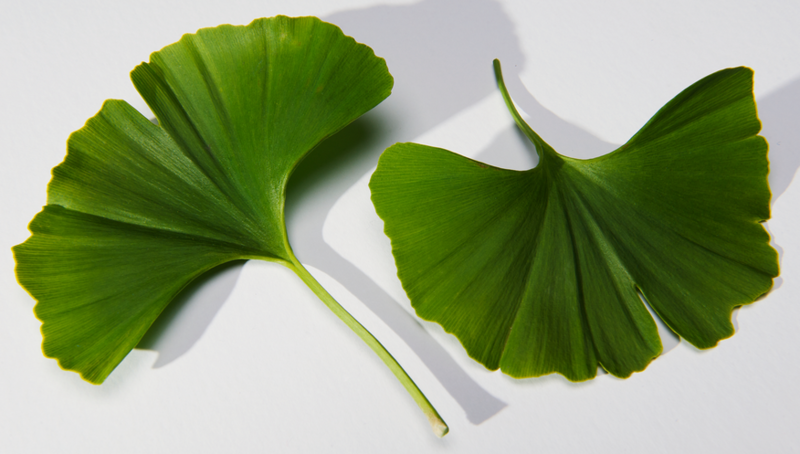 Ginko leaves contain flavonoids and terpenoids which have potent Antioxidant properties. Clinical studies show that these flavonoids have the ability to protect cellular health via DNA preservation in the nervous system, heart, blood vessels and retinas. The terpenoids improve blood flow via blood vessel dilation and slowing blood clot formation. Ginko has been shown to promote the production of fibroblast collagen, something which is incredibly important in the science of anti-aging of the skin, since the collagen net is the primary factor in loss of elasticity which causes sagging, thinning and wrinkles. Much of the aging process is due to environmental stressors (meaning we have some control over the aging rate and progression with our lifestyle choices) SEE THIS ARTICLE. Ginko extract also balances skin tone and assists in diminishing the appearance of sunspots and other skin discolorations by improving blood circulation and cellular regeneration of the dermal cells.